Review: I say this a lot, but that cover is incredible and adorable and just, ugh. I love it. The premise itself is a lot of fun too. Desi Lee is an over-achiever in every way but one – namely, romance. After encountering the hot and mysterious Luca Drakos, Desi formulates a plan to enter the dating game… by taking inspiration from a Korean drama. Now, as anyone who has watched a kdrama knows, there’s plenty of beloved tropes and classic scenarios that make up a standard storyline. 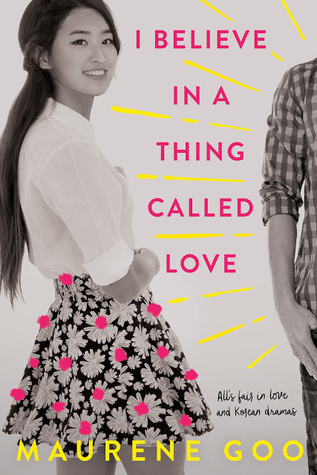 Inspired by her single father’s love for kdramas, Desi creates her own guide to true love and follows those steps to a T. Of course, chaos (and romance) ensues. The book is adorable and hilarious to read. There’s no getting around that. Desi Lee is a wonderful character – successful and driven but totally incapable of flirting or getting the guy. I honestly cried reading the first chapter that establishes exactly how motivated and driven Desi is, along with her bond with her widower father. And while we’re at it – hands down, my favorite character was Desi’s father. He reminded me so much of my own mother and her notes to me that are a mix of Chinese and English. Desi’s friends are awesome as well. The one thing that did trip me up a bit was just how closely Desi followed the kdrama steps – some of which were more morally murky than others. I’m still not sure what to make of the ending, to be honest. All in all, this was a fun and refreshing read. Not to be cliche, but it’ll put a smile on your face. If you love kdramas, this is absolutely a must-read. (Loved the shoutout to such dramas as Oh My Ghostess!) Check it out when you get the chance!